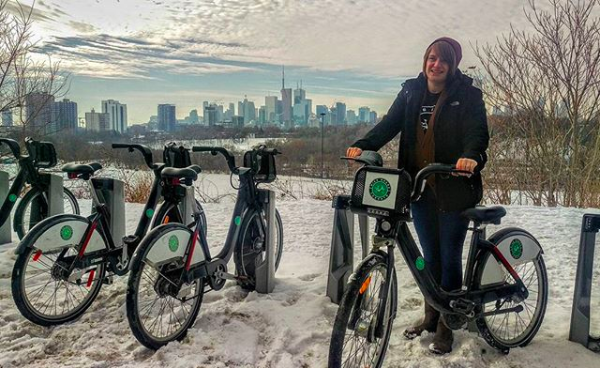 Get into the holiday spirit with Bike Share Toronto! Snow is falling, lights are strung and the fire is stoked. 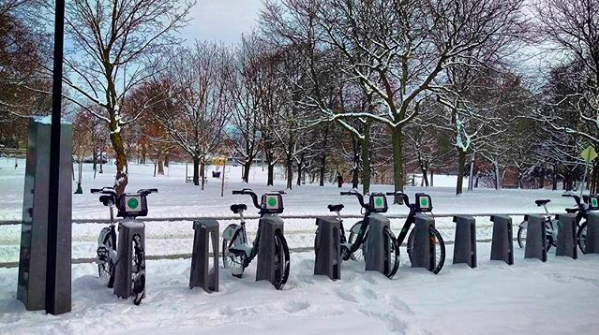 December is here and Toronto will be transforming into a winter wonderland. During the holidays, the waterfront transitions from a summer time favourite to a winter spectacular. Ontario Place is a destination during the holidays for its stunning lights. The Winter Light Exhibition returns this year, along with the new Aurora Festival, to canvas our harbour in holiday spirit. Whether you are attending one of Ontario Place’s seasonal events or light gazing, we’ve got you covered. Hop on one of our bikes and pedal down to our station at Lakeshore Blvd W + Ontario Dr to dock and take in the sights. The iconic holiday decor of the Financial District is not something you want to miss this year. This neighbourhood is known for going BIG during the holiday season – literally. We’re talking gigantic trees, oversized ornaments and snowflakes bigger than your head. Some of the most revered decorations can be found at First Canadian Place, Brookfield Place, Scotia Plaza, Commerce Court, and the TD Centre. The Financial District supports a plethora of our stations, making decor admiring easier than ever. Pick-up a bike and ride from building to building, docking to get a closer look at your favourites. 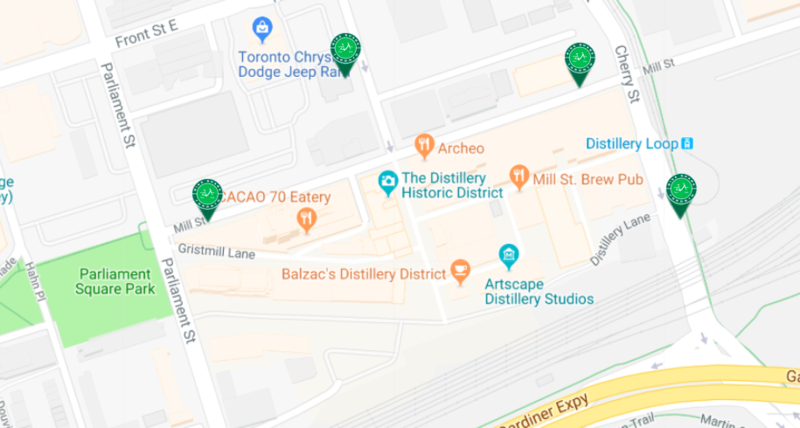 Some say that celebrating the holidays in the Distillery District is a tradition in Toronto – we couldn’t agree more! To say this neighbourhood decorates for the holidays would be an understatement. Welcoming the Toronto Christmas Market for another season, the Distillery District becomes the epicentre for holiday celebration. Want to meet Santa? Buy a gift for a special someone? Sip hot chocolate by a fire? Dock at one of our four stations in the area and enjoy! What could possibly make the home to our Toronto Sign more exciting? The holidays. Nathan Phillips Square attracts thousands of Torontonians during December with its dreamy skating rink, artisan village, tasty treats, holiday midway and more. Fair in the Square‘s magical performances and activities makes for the perfect holiday experience. Why not grab a bike and ride to the festivities? 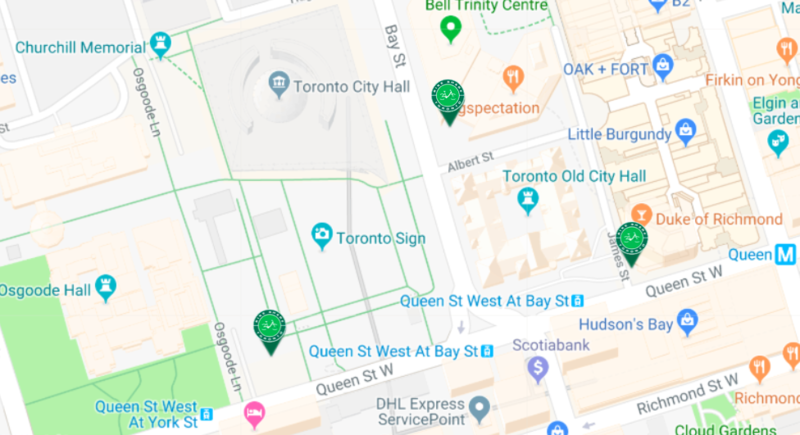 We have three stations close-by, making getting to and from the square quick, easy and fun! The East End gets its holiday magic along the shore. Making the waterfront a destination for Torontonians in the winter time, Declute Light up the Beach transforms the boardwalk into a twinkling fairytale. More than 80,000 bulbs and 20,000 feet of wire are hung to create a dazzling spectacul. Pedal to the East End, docking at one of four statons, and let your imagination run wild in the sea of colour and sparkle. There’s nothing like a 40-foot tree, 52,000 LED lights and shopping to get you into the spirit. Every year, Yonge & Dundas Square erects a sky-scraping tree to mark the beginning of the holidays and busy season at this popular shopping hub. 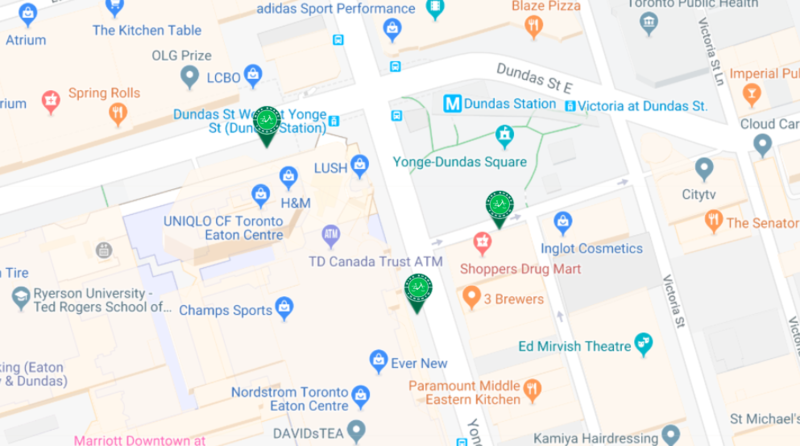 With the Eaton Centre steps away, along with numerous surrounding stores, Yonge & Dundas Square not only gives you a healthy dose of holiday joy but is a great location to get your holiday shopping done early. Avoid the traffic of the downtown core by grabbing a bike. We have three stations in the Square – perfect for the holiday shopper. Don’t worry, we have baskets to carry your purchases home! Planning your route? 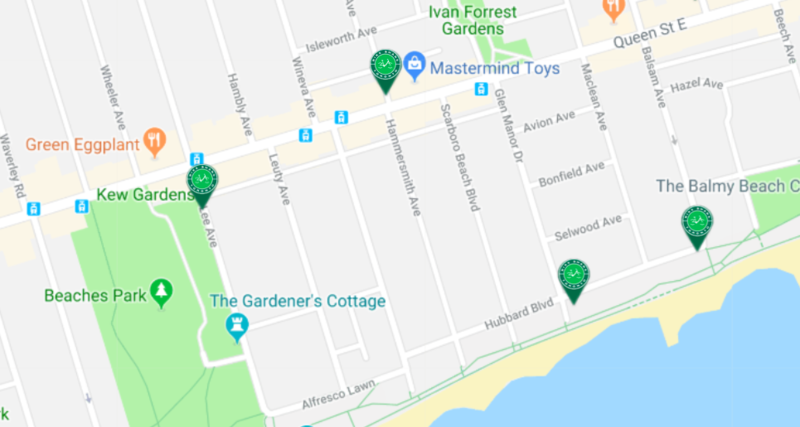 Access up-to-the-minute bike station locations and availability via the System Map or CycleFinder. Make sure you have it downloaded from the Apple Store or Google Play. What’s your favourite holiday ride? 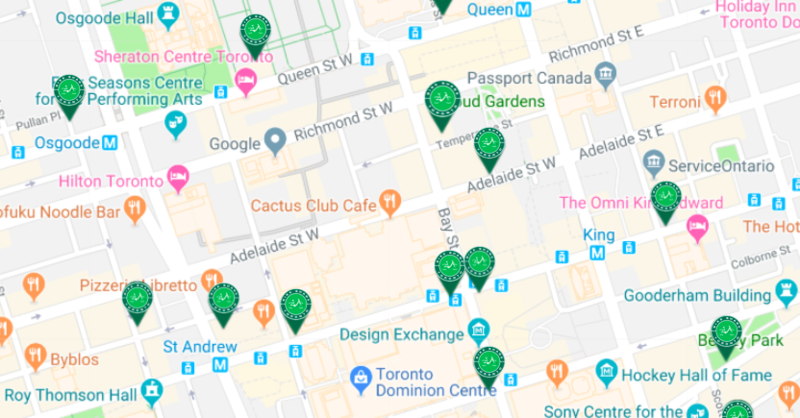 Tag us with #BikeShareTO and let us know.